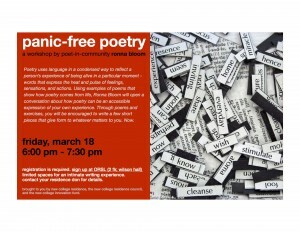 Are you looking for the Poet in Community? Please come over to the Poet in Community page on the Hart House website. Or you can join the PIC Facebook group. This blog is more an archive now. If you’re interested you can scroll back to previous workshops, poems and happenings. Hey poets and poetry lovers or likers — a double-header! 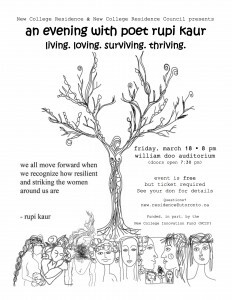 I’ll be doing a Panic-Free Poetry Workshop tomorrow followed by a performance by Rupi Kaur. Come, write, listen, be. Sometimes the relationship with what or who we are studying goes stale. We lose heart. This two-hour workshop aims to coax you into different kinds of conversations between work life and creative self, between heart and page. Using poems, prompts, and memories, bring yourselves back into the room with what you know in a new way. Every day that you are a student you’re also perhaps a friend, an animal lover, an activist and more. In these four writing workshops we will look at every day moments of distraction and exhaustion, attending also to the pull and call of passion and vocation. Through writing and conversation, we will look at ways to become more present, nourished, and connect or reconnect to what you love and why you’re here. There will be four sessions. You are welcome to attend any one or all sessions. No experience necessary. 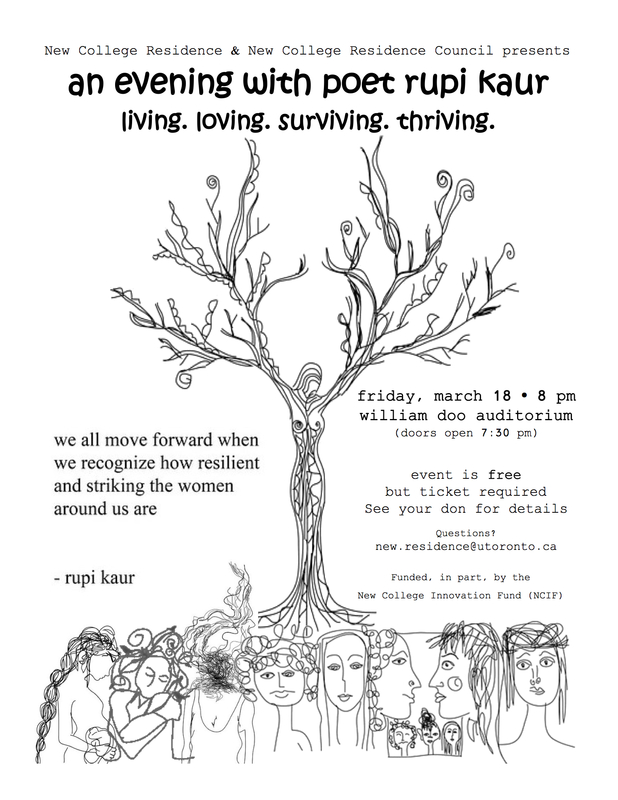 The Poet in Community program at the University of Toronto has used poetry to stir reflection and conversation for the last 8 years. 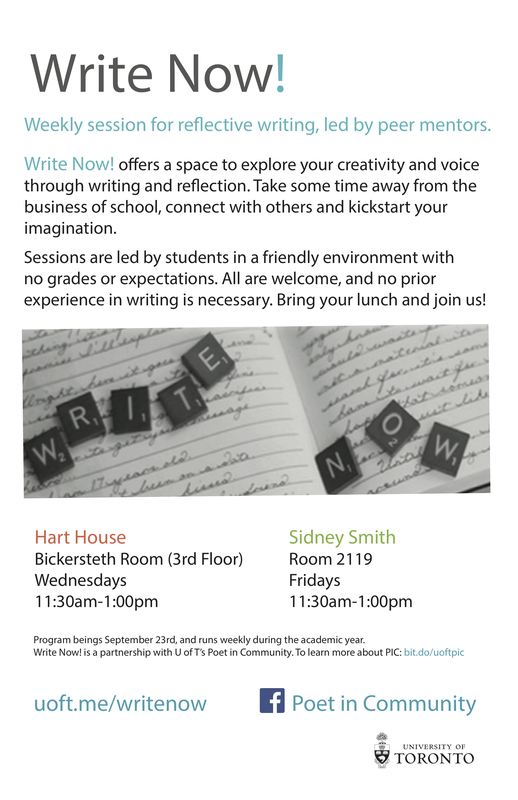 The last 2 years has seen the creation of an additional student mentor program called ”WRITE NOW!” Now Talking Walls at Hart House will showcase both programs in an exhibition of poems and prose pieces. Come and read work by individual students as well as by groups. Also poems I wrote at Spontaneous Poetry Booths. On January 21st at noon meet at the “WRITE NOW!” table at the HART HOUSE literary Fair and we will stroll over and read the walls. Day Milman, program coordinator at Hart House, prepares the poem “The Encounter”. 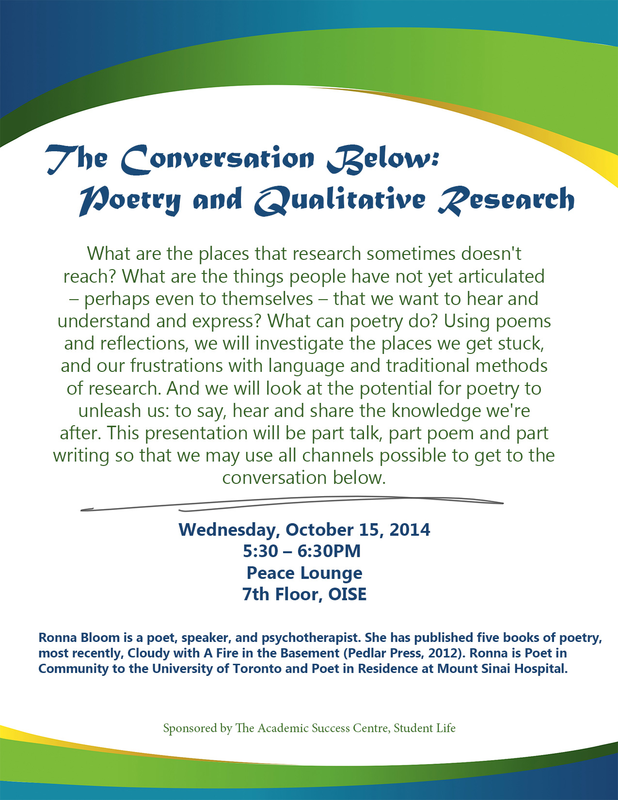 Have you ever participated in a Poet in Community workshop or attended a WRITE NOW session? Talking Walls at Hart House has invited PIC to have an exhibition of work to showcase the program. *Please let us know if it was written in a WRITE NOW workshop or POET IN COMMUNITY workshop (aka with Ronna); if it was in a class setting or somewhere else. *It would be helpful to include a sentence describing the theme of the session or prompt. 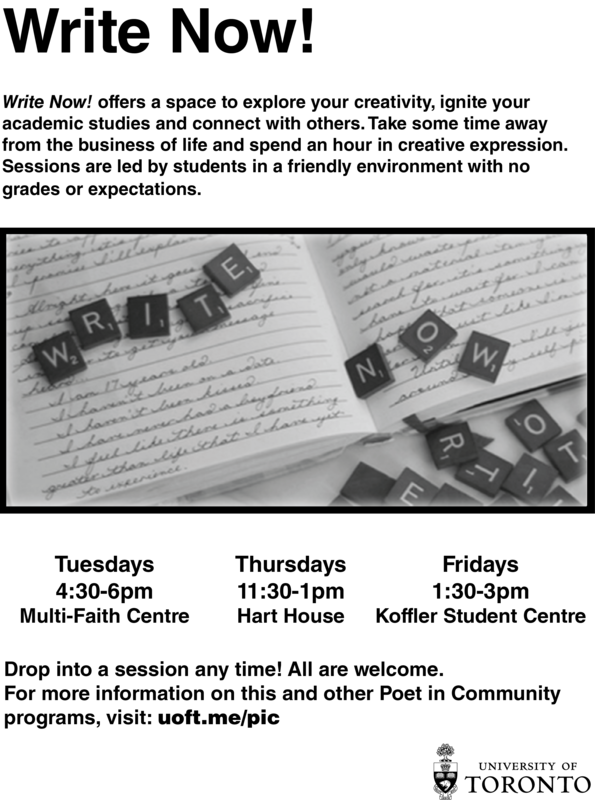 Write Now! is a program of free drop-in writing sessions where you can nurture your own voice and creativity through writing and reflection. All are welcome. No previous writing experience is necessary. Join the Poet in Community Facebook group and get updates about what will happen in each session. The Poet in Community (PIC) program creates a space that’s not as formal as a classroom, or as casual as a cafe. It’s a learning experience without evaluation. There’s no teacher and no boss. In these workshops and conversations, use writing to connect the intellectual with the emotional, the physical and the social. Don’t be put off by the word “poet” — no special experience is necessary! Do you struggle with finding words to express your experiences? Do you stare at the blank screen with your heart pounding? Would you like a place of self-expression without grades or expectations? Write Now! 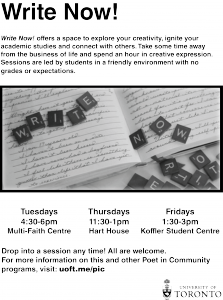 is a program of free drop-in sessions run by peer mentors, where you can nurture your own voice and creativity through writing and reflection. Groups meet weekly in three locations across campus: the Academic Success Centre, Multi-Faith Centre and Hart House. What are the places that research sometimes doesn’t reach? What are the things people have not yet articulated –– perhaps even to themselves –– that we want to hear and understand and express? What can poetry do? 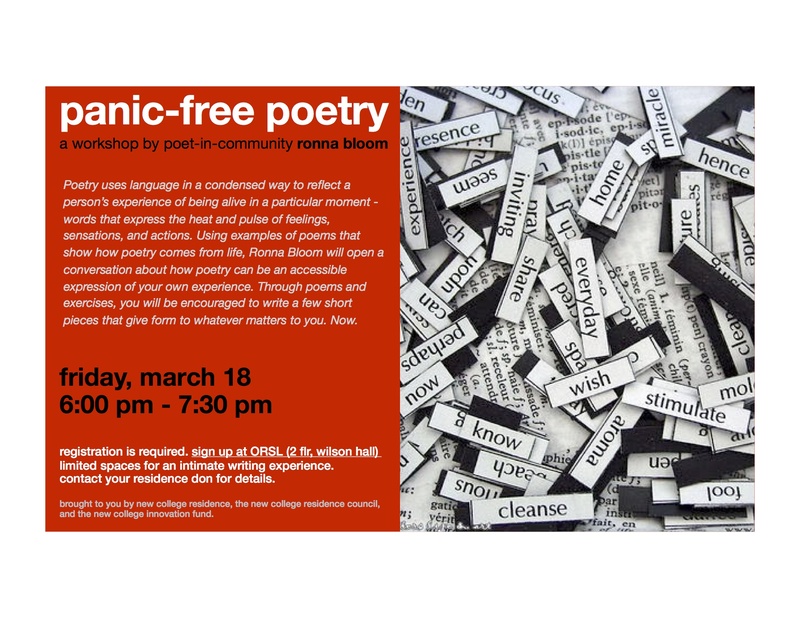 Using poems and reflections, we will investigate the places we get stuck, and our frustrations with language and traditional methods of research. 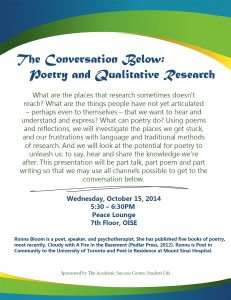 And we will look at the potential for poetry to unleash us: to say, hear and share the knowledge we’re after. This presentation will be part talk, part poem and part writing so that we may use all channels possible to get to the conversation below.